A heavy fine dust concentration continues to envelop the Korean Peninsula on Sunday, with 5 to 20 millimeters of rain expected in the southern region at night. The average ultrafine dust level stands at 54 micrograms per cubic meter in Seoul, 55 in Siheung city northwest of Seoul, 30 in South Chungcheong Province and 40 in North Gyeongsang Province. While the current ultrafine dust levels aren’t bad enough to warrant an official warning, they hover well above the “bad” levels, which range at around 35 micrograms per cubic meter. 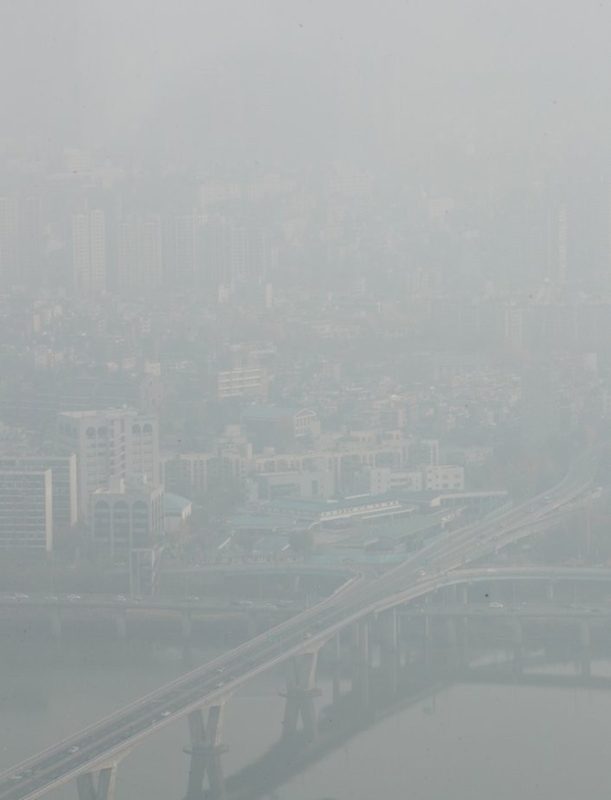 According to the weather agency, Seoul will see a daytime high temperature of 13 degrees Celsius, the northwestern city of Gangneung 15 C, the central city of Daejeon 13 C, the southwestern city of Busan 18 C and the southeastern city of Gwangju 16 C.
Toxic levels of fine dust particles in the air call for anti-pollution masks.